In preparation for my John Cassavetes panel discussion from a couple of weeks back, I decided to look into the director’s less-celebrated and/or actor-only efforts, just to see if I’d missed any lost gems. Now that the much-lauded Love Streams is simply out of the run as a potentially great work, perhaps there’s something else out there that qualifies? Saddle The Wind. Image via Wikipedia. 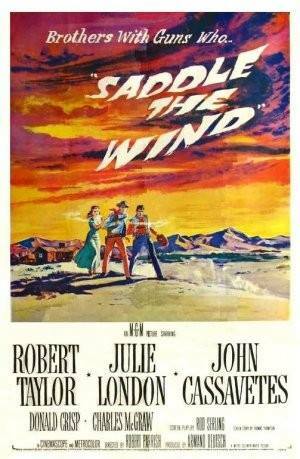 Directed by Robert Parrish and written by Rod Serling, Saddle The Wind is an odd little film that, in 1958, was notable for starring Robert Taylor, but today is strictly remembered due to the names Rod Serling and John Cassavetes. The titled lured me in with its sense of poesy, and with Rod Serling (of Twilight Zone fame) as writer, I was hoping for a neglected classic. Yet the film is poorly scripted, cliched in parts, features a bad, tacked-on ending, and mediocre acting from all involved, except John Cassavetes. In fact, from the first shot of Nick (Cassavetes) in the sun, the viewer simply sees a different caliber of acting that subtly predicts Nick’s character arc without giving too much away. 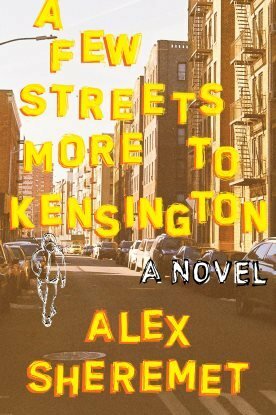 The way Nick blinks, or moves his hands nervously; the tiny, easy-to-miss gestures; the disappearing smiles or slight shifts of mood — these are all hallmarks of character realism, and present Nick as a real entity with an accumulating, psychotic streak as opposed to a mere symbol of this or that. There’s little Nick can stand for, and despite the script’s issues, it’s a credit to Serling that Nick is simply a villain transplanted to the Old West, as opposed to the heavy-handed ‘commentary’ that the Western genre had become known for by this time. Sure, the decision also strips the film of depth, but a few subversions of genre tropes, like this, keep Saddle The Wind from being in worse company. An OK work, overall, but one of Rod Serling’s minor efforts, even as it’s one of Cassavetes’s best performances from the 1950s. 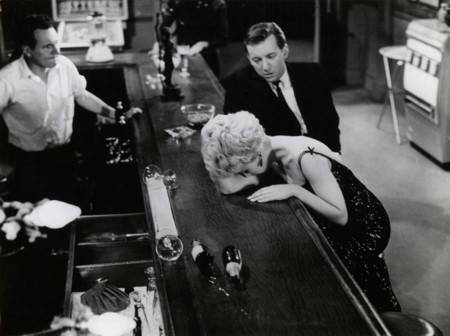 Stella Stevens as Jess. Source. Of all of John Cassavetes’s ‘meddled-with’ productions — these include A Child Is Waiting, Gloria, Big Trouble, and 1 or 2 others — this is no doubt his best, and retains more of his characteristic style and vague character resolutions that manage to keep a few possibilities open. It begins with a jazz musician, Ghost (Bobby Darin), and an aspiring singer, Jess (Stella Stevens), seemingly falling in love, then trying to figure out what to do about their careers. Ghost is idealistic while his band-members are ready to compromise, but, as with so many other artists with potential, Ghost’s personal lacks (physical cowardice, irresponsibility) feed into the art, as well, thus stripping it and ruining both his chances with Jess as well as art. He leaves the band, makes some money as a sell-out (via a patron who sees right through him), and finally returns to his band, only to realize they’ve sold out even more than he has. One gets the feeling, then, that Ghost feels vindicated about them, but, given that he’s no true artist, himself, this vindication offers little, for lacking true talent, he’s sacrificed without recompense. There is no clear resolution with Jess, who’s spiraled out of control, nor any real suggestion that the characters’ ends could have been much different given who they are at essence. There are lots of memorable shots throughout, such as in the fight between Ghost and a local jackass, Ghost’s shielding himself, and the subsequent daze; Ghost’s turn towards bitterness, which nicely plays off the criticisms of his friends’ ‘seriousness’ early on, thus casting doubt on Ghost’s original wisdom; the unexpected changes of all involved, even as second and third viewings reveal that these changes are logical, and fit the pattern of human weakness. It’s shot in a fairly ‘plain’ manner (a sidestep from the earlier Shadows and the later Faces), and parts of the script were probably forced from the outside, but it’s easily the best of these 5 films. Judy Garland in A Child Is Waiting. Source. While Too Late Blues was meddled with, it WAS directed, in a purer sense, by John Cassavetes, and the script was more or less his own. Not so with A Child Is Waiting, which was written by Abby Mann and has few Cassavetes-esque flourishes, ensuring that it could have been directed pretty much by anyone with identical results. Although the film has the reputation of being overly didactic, it’s clearly more than this, for there are subtle moments of acting and scripting (though not really directing) throughout, including a memorable line from the school’s chief investor re: the capabilities of retarded children vis-a-vis the ‘accomplishments’ of others, most of which, he argues, are quite silly and forgotten, anyway. 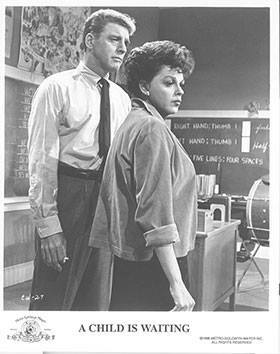 None of the characters are cliches, from the retarded boy’s father, who wishes the boy were dead (delivered, by the way, without malice; merely fatigue), to Jean Hansen (Judy Garland), who wants to do ‘more,’ to the school’s headmaster, who plays up to a good mix of coldness/inability to connect, as well as prudence. He could have easily been a caricature – which is where pure didacticism and propaganda might come in – but this is quietly avoided. That said, much of the film plays in a fairly conventional, straightforward way, a fact that grated on Cassavetes, who kept trying to show more of the children, themselves, via their words and actions, without the other actors’ input or interruptions. Now, it’s hard to say whether Cassavetes’s own desires would have made for a better film (he was often scatter-shot whenever deciding to merely ‘let the camera roll,’ for this is NOT how art is made), but it’s also obvious that, barring some lines and a handful of well-done scenes, this is a merely solid work that’d benefited from a little more experimentation. The narrative, itself — Jean Hansen’s desire to find a new way of relating to these children — is too prosaic in its facts as well as in its telling to carry the film’s brunt, which is precisely what it has to do, given Cassavetes’s lack of control here. Mia Farrow in Rosemary’s Baby. Source. A blockbuster in its time, and a cult classic, today, Cassavetes derided Rosemary’s Baby as a ridiculous piece of entertainment by an otherwise great director. 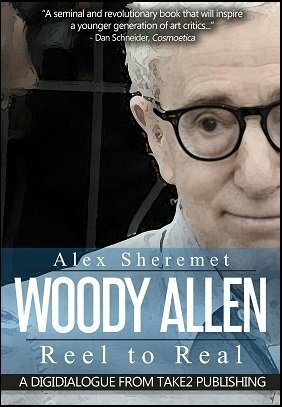 But while the 98% RottenTomatoes rating for this film seems to contradict him, reality does not, for despite the claims of the film’s multiple levels of reality — is it a fantasy? psychosis? something real? something in between? — the deeper point is that none of this really matters, at all, given the nature of the film, the thinness of its characters, and the poverty of its revelations. Mia Farrow plays Rosemary Woodhouse, wife to Guy (John Cassavetes), who apparently makes a deal with Satan (or at least his worldly representatives) for personal success, to have Rosemary give birth to Satan’s child. None of this is revealed from the start, of course, as Roman Polanski tries to build it all up with creepy shots, ‘mysterious’ characters, inexplicable smells, tastes, occurrences, etc., and rituals that may or may not be occurring. After fighting with these visions, and others’ comments re: Rosemary’s possible psychosis, for the life of her child, she finally gives in and inexplicably decides to raise Satan’s progeny. Of course, it’s a ridiculous character arc, and a piss-poor ending, to boot, but even worse are the lead-ins to it. Sure, one can argue whether or not Rosemary is experiencing reality, but the fact is, psychosis or no, there’s NOTHING of import revealed of Rosemary or Guy (the latter of which simply appears, disappears, and manipulates, as an almost comic-book level villain) in this schism. In short, her suffering means nothing, is connected to nothing, and plays as little more than a ‘whodunit’ with a surface-level payoff. Really, ask yourself: Rosemary learns what? Polanski communicates, why? For not even John Cassavetes, an otherwise great actor, has much to work with, and therefore plays up to little more than a stereotype. A bad film propped up for decades merely on the superficial ‘excitement’ of the viewers’ first watching, and the hook of figuring out who’s responsible — but, alas, never why, and with never much reason to care. This was a project that Elaine May wanted to do for a while, thinking that she’d stumbled upon the perfect pairing with John Cassavetes (Nicky) and Peter Falk (Mikey). The film follows the last night or so in the life of Nicky, who’s stolen money from his mob boss and fears he’s about to get killed. The viewer gets the sense, from Mikey, that Nicky is a typical delusional, that he’s often afraid for his life, a fact that nonetheless rings false in this situation, for the theft’s never denied, and must clearly have some kind of consequence. As the film progresses, Elaine May tries to ‘blur’ the lines between friendship, betrayal, and possible psychosis by keeping the viewer guessing as to what’s really going on, before Nicky is killed after Mikey delivers him to the hit-man. Yet there are two problems here. First, it’s obvious, quite early on, that Nicky is in on the plot — despite May’s attempts to give two sides to each and every word or action — for some things, such as Mikey’s obsession with the phone at a local bar, is inexplicable with any other interpretation. This means that what’s left of the film’s depths must be seen in Falk’s acting, as he tries to convince Mikey of his good intentions, and the viewer tries to plumb the extent of such lies. Second, just as with Rosemary’s Baby, Elaine May makes the mistake of believing two possible interpretations of a simple plot-line automatically translates to the art somehow being multi-layered. It is not, for ‘multi-layered’ implies not only more than one level of interpretation, which is little more than a technicla trick, but that these secondary (and tertiary) interpretations can lead to something interesting and deep, via characters’ psyches, or some other means. This, and only this, is what propels art to greatness. And, in this case, it doesn’t. True, there are scenes of bonding within the film, with some of it comparable to Husbands, but as with Husbands, one sees no real reason for these two men’s friendship, save that they work together, and know the same people, and the slow build-up of tension and anger, on Mikey’s part, reveals little but Mikey’s envy over his friend, with no real defining moments re: its provenance or effects. In reality, then, the film can only be interpreted on one level — that of a man clearly betraying his friend — with lots of pointless detours before he’s able to do so, ‘pointless’ because these detours serve to neither deepen nor illumine the characters, nor even move the plot along. This is a film with a complicated production history, but May’s final edit (or something close to it) was released within the last decade. The Killers is an underrated film. JC’s performance is good to very good in a solid film.